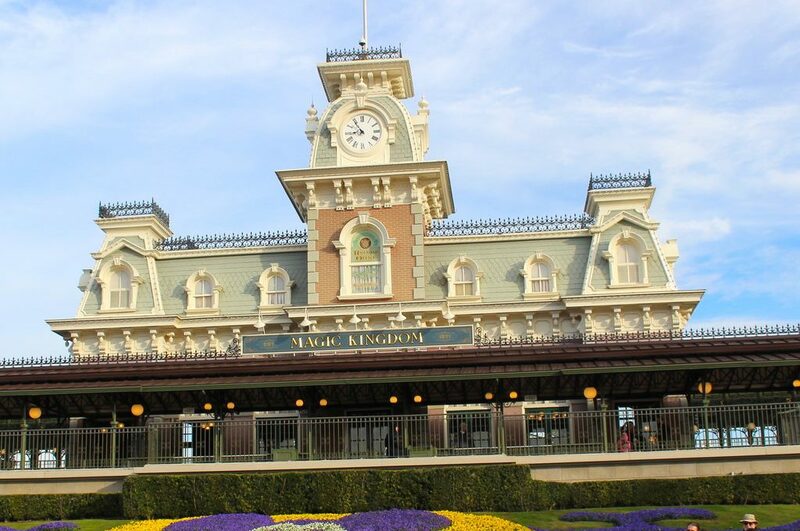 Walt Disney World’s Magic Kingdom has expanded and changed greatly in its 46 years on the planet. Disney fans love to go on and on about what’s gone and what’s coming. But for people who don’t visit very often, they want to know what is in the park right now. So, here’s a “101” (* starred items are Pop In team member favorites). 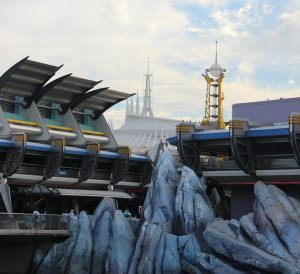 Which “mountain” will be your favorite: Space Mountain (above), Splash Mountain or Big Thunder Mountain? 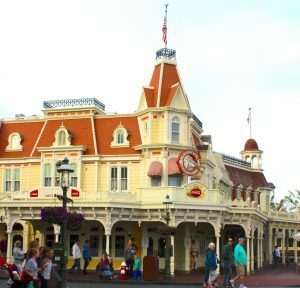 Magic Kingdom offers sit-down restaurant dining, fast food quick service dining (like Casey’s Corner pictured above), and snacks around every corner. It’s impossible to go hungry, but it is possible to go broke. A great tip is to share meals and snacks. Portions are large at Disney. 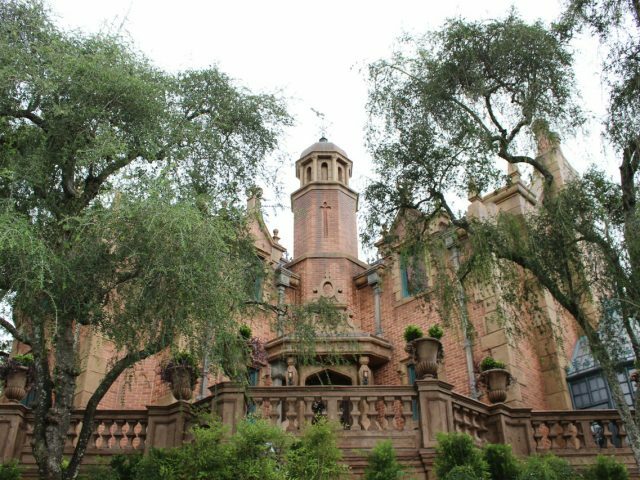 Cinderella’s Royal Table*: A castle themed, character dining, sit-down restaurant serving high end entrees. Cosmic Ray’s Starlight Café: Quick service restaurant serving burgers, hot dogs, chicken, etc. Impulse shoppers beware. Take photos of all the great souvenirs encountered during the day, and then before you leave the park scroll through your photos and pick the one thing you really love and buy it. It’s a great way to avoid buyer’s remorse. 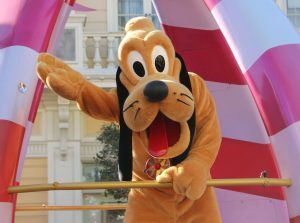 Pluto hangs out by the flag pole outside the Town Square Theater to meet guests, sign autographs and pose for photos. Don’t forget to go inside the Theater and meet Pluto’s owner, Mickey Mouse. 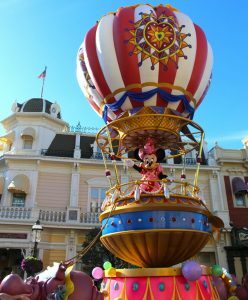 Disney built some amazing floats for the Festival of Fantasy Parade. 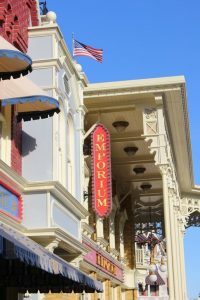 Early in the morning is the best time to see the Main Street, U.S.A. vehicles in action. 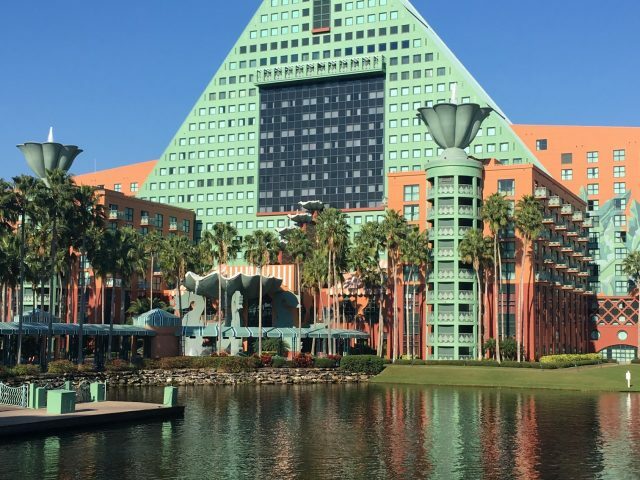 You can only get to the Magic Kingdom by bus, ferry, Monorail or walking from the Contemporary Resort. 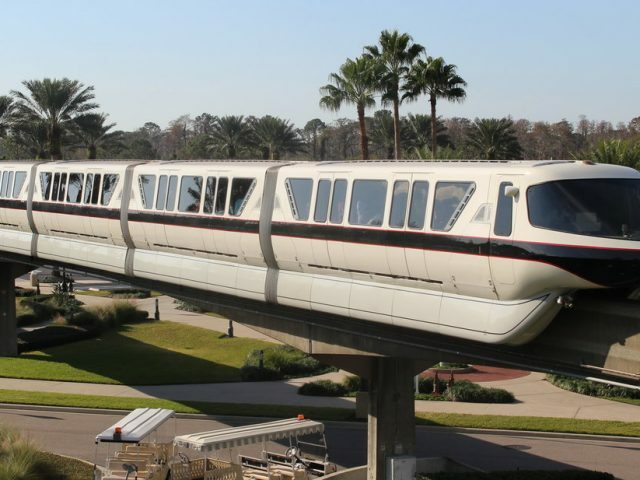 The Monorail* is the most magical. Inside the park, the Walt Disney World Railroad* can transport you easily around, with stops on Main Street, U.S.A., Frontierland, and Fantasyland. 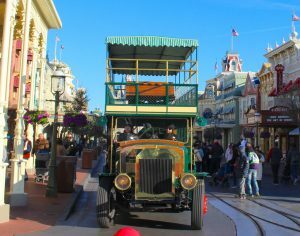 At times, Main Street Vehicles also offer one-way rides down Main Street, U.S.A. The vehicles include a horse-drawn street car, jitney, fire engine and omnibus. Keep the kiddos entertained throughout the day with Sorcerers of the Magic Kingdom* (Main Street, U.S.A.) and a Pirate’s Adventure ( Adventureland). These stops will cost you (a lot), but if your child wants to transform into a pirate, a princess or a knight, visit The Pirates League-Disney (Adventureland) or the Bibbidi Bobbidi Boutique (Fantasyland). 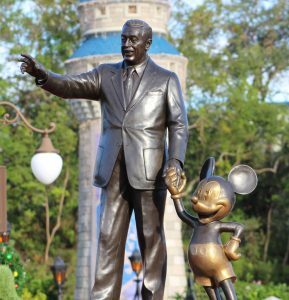 The Partners statue stands in front of Cinderella’s Castle. In the evening, it’s the best place to watch the Happily Ever After fireworks. The “Partners” statue of Walt Disney and Mickey Mouse in front of Cinderella’s Castle and the “Sharing the Magic” statue of Roy Disney and Minnie Mouse in Town Square are touching tributes to the Magic Kingdom’s founding fathers. Coins from the fountain makes wishes come true for guests and a lot of local charities. 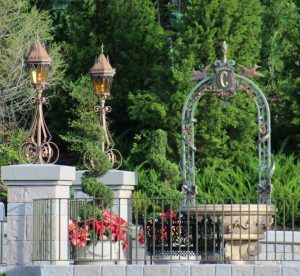 Cinderella’s Wishing Well is located between the castle and Fairytale Garden. Thousands of coins are thrown into the fountain each day. Once a large sum accumulates, Disney donates it to a central Florida charity. The Frontierland Shootin’ Gallery has been around for a loooong time. It’ll cost you about 50 cents for 25 shots. The Purple Wall in Tomorrowland is newly painted. It’s a fan favorite for selfies. Hope this helps in planning your next trip.